The Chessie’s primary duty in the early 1800s was that of waterfowl retriever – which remains true today. They were used extensively by market hunters, who with their large punt guns could decimate flocks of ducks and geese, which the retrievers picked up – sometimes hundreds in a single day. Legend has it that Chesapeake Bay retrievers were dual-use dogs – they retrieved waterfowl by day and guarded the boats, guns and day’s haul at night while the market hunters caroused in waterfront saloons – and this is what has led to stereotyped traits in the modern breed (one-man dogs, strong guarding instincts, apt to bite, etc.). While market hunters might (or might not) have expected their dogs to both retrieve and guard, they were not the driving force behind the breed’s development. Contrary to popular belief, market hunters did not develop the Chesapeake Bay retriever. The distinction of creating a tenacious, water-loving working dog that could withstand the rigors and cold temperatures of rough, open seas belongs to the members of the bay’s many wealthy duck-hunting clubs. They’re the ones that put the work into establishing a dog with a consistent type and disposition that became the Chesapeake Bay retriever. That consistent look includes a powerful medium- to large-sized frame with a distinctive double coat – an outer coat that tends to be short, harsh and wavy on the shoulders, as well as slightly oilier than other retrievers, with a dense, wooly undercoat. In combination, the two coats shed icy water and insulate the dog while making repeated retrieves. The three acceptable coat colors for Chessies are brown, sedge and deadgrass. Their yellow or amber eyes compliment their coat. While their dedication to working the harshest waters has never been in doubt, personality stereotypes tend to dog the Chessie. They’re often characterized as one-man dogs (possible) with a strong guarding instinct (likely no more than any other similar dog), which make them prone to biting (decidedly false). They’re also dogged by the stereotype of being stubborn dogs that are difficult to train – another fallacy. Rather, they are an intelligent, courageous, happy and affectionate breed that will work hard at whatever task is set before it – hunting, field trialing, tracking, obedience or in the conformation ring. 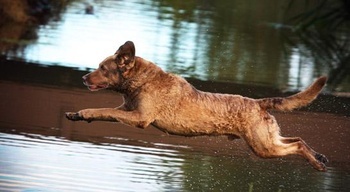 Interestingly, the Chesapeake Bay retriever is a breed that can still produce dual champions – those that excel in both the field-trialing game and the conformation ring. A rarity these days. As larger dogs, Chessies have a lifespan of approximately 10 to 12 years. They suffer from structural, neurological and neuromuscular problems, as well as blood and eye issues. Like other retrievers, Chessies are prone to hip dysplasia. At Paw Print Genetics, we offer a three-test panel that screens Chesapeake Bay retrievers for exercise-induced collapse, degenerative myelopathy and a form of progressive retinal atrophy. Buying a puppy that has been tested for or comes from parents screened for these genetic mutations, as well as having their hips evaluated, is the most important step a buyer or breeder can take to help better the health of the breed.